In 1956 I was experimenting with a synthesizer which had the following specs – one oscillator with one waveform (close to a sine wave), an internal amp and speaker, and no keyboard. 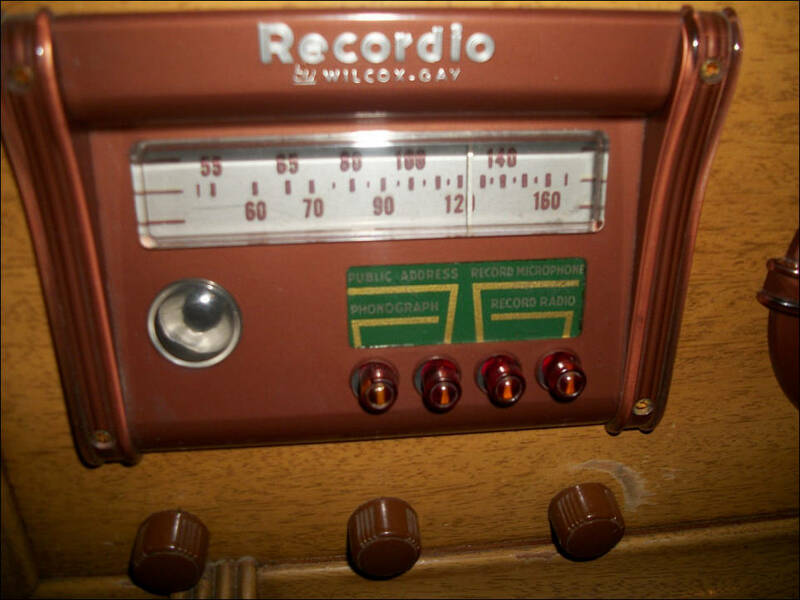 In actuality it was my father’s 1946 Wilcox-Gay Recordio 630B, a versatile device which included an AM radio and a record player/recorder (78 RPM). Click here for a photo. But the button that captivated me was “Public Address.” This sent the mic signal directly to the speaker, and my sister and I loved the sound of our amplified voices. After watching Howdy Doody or The Lone Ranger, we would grab the mic and do our own shows. The first few feedback howls terrified us, but I eventually realized that the feedback could be controlled by the volume control and the proximity of the mic to the speaker. I could create pitch sweeps and vibrato effects by moving and shaking the mic in different ways – a poor man’s Theremin. My earliest recollection of the fragrance of warm tubes came from the 630B. (I have a few pieces of tube equipment in my studio and occasionally turn them on for some serious comfort scents.) The 6E5 “Magic Eye” tube (on the left in the photo above) had a HAL – like hypnotic effect on me. (My first tape recorder would use two of these tubes). I spent hours experimenting with feedback and with distorted vocal sounds – steady tones, plosives, noises, etc. Five years old and I was already hooked.